fateful polar exhibition 1910-12, entitled “Step into my Shoes: significant journeys on foot”. Curated by and including new work by Clare Abbatt, the events reflected on the importance of Scott’s extraordinary journey, and considered other significant journeys made on foot, including John Clare’s. 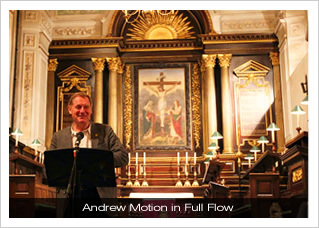 All Saints’ Church provided a fitting venue for Sir Andrew’s talk and reading; it was a favoured haunt of John Clare when he was a patient at Northampton Asylum (now St Andrew’s Hospital) for the last twenty years of his life. 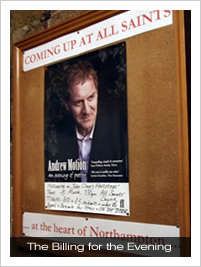 During his time there he was allowed to walk into town each day and would often walk to All Saints’ Church and sit in the portico to watch the world go by, chat to people and write poetry. 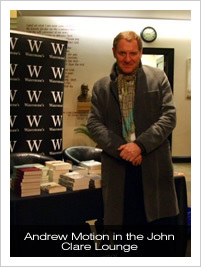 After the talk, Sir Andrew relocated to the John Clare lounge to sign books.